Omaha Hi Lo is the ultimate game of draws and it is the excitement of always looking for a better hand that gives it a unique appeal. At showdown the pot is split equally between the best high and low hands. To qualify for a low hand you need 5 different cards all of which are 8 or below. Hands are made up of exactly 2 cards from the 4 in your hand and 3 from 5 cards on the board. Different cards may be used to determine the high and low hands at showdown. The large number of hand combinations can make Omaha High Low strategy seem complex. However with the following 5 simple tips you can seriously get a head start on most of the other Omaha players out there who still fail to understand the game. The most important decision in Omaha Hi Lo is made before the flop. Whether to enter the pot is determined by many factors including your cards, table position and the playing styles of your opponents. You will often be getting a good price to draw after the flop, which will tempt you to lose money if you play with inadequate hands, so selecting only good hands to play before the flop becomes especially important. This ensures that you are not making mistakes by being ‘priced in’ to calling with the second best holding later in the hand. So even more so than in Texas Holdem, you need to be disciplined and play a tight starting hand strategy. The best fixed limit Omaha hi lo starting hands are those with the potential to win both the high and the low parts of the pot. Winning both pots is known as ‘Scooping’ and must be your objective with every hand played. Examples of strong hands with scoop potential include those with an ace and other suited low cards. For example A-2-4-K double suited (2 cards each of 2 different suits) can easily win the low pot with the small cards and the high pot with a flush or straight. So look for multiple possibilities in your starting hands, count them out, straights, flushes, low hands etc. If there are multiple then chances are the starting hand is a good option to play. If you can only see one possibility then you are usually best to wait for a better hand. Some hands play better against one or two opponents – while others are better when played multi-way against lots of opponents. For example A-2-3-4 suited to the ace has great scoop potential and can be played multi-way. While A-A-3-K may win the high side of the pot without improving as well as the low side, the best chance of scooping with this hand is to cut down the number of opponents by raising pre-flop. The trick is to recognise what type of hand you have. If you are holding a hand that plays better against one or two players and lots of players are in the pot, then you either need to raise to get some players to fold, or get out of the hand yourself. Hands such as 7-8-9-10 are not very playable in Omaha Hi Lo. In order to win the high pot you would usually need a straight, this can easily become second best to an opponent playing picture card hands. If you make the top end of a lower straight then the pot will be split with a low hand – and there is a danger of losing the whole pot to a flush or even full house. Playing low-only hands in Omaha Hi Lo runs the risk of being ‘quartered’. This describes the situation in which you share the low side of the pot while an opponent takes the high side. In this situation you are only getting a quarter of the pot in return for putting in half of all the bets in the pot. In other words you haven’t covered your bets and you have lost money in this hand. With weak low hands, especially those not containing an ace, it is often best to fold in the early betting rounds. This becomes more important if you are between two opponents who may start a ‘raising war’ with high and low hands. Get on an Omaha Hi and not a Omaha Lo! 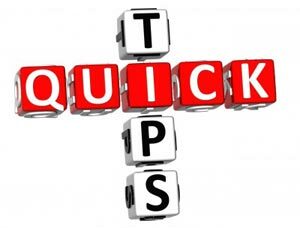 If you pay attention to the 5 quick tips above, you will already be playing at a higher standard of Omaha Hi Lo Strategy than most other players who are simply playing Omaha as a change from their regular game of Holdem. Their money is up for grabs and there is no reason why it shouldn’t be you that claims it.